It is a truth universally misunderstood by young people that watching a play about self-destructive behavior, devoid of any character development, is interesting. 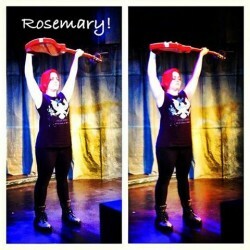 Rosemary, presented by Riot Productions, was a new work written by Seth Tankus about a post-high school unemployed stoner, who isn’t even playing in a band anymore. Predictably, she was raised by a teenaged alcoholic single mother. She spends her time drinking, sleeping with a drug dealer, smoking weed, bickering with her mother and her flamboyantly gay male best friend. Unfortunately, she only tries to change her external circumstances and never her inner life, so there was little excitement in watching her lurch from one clichéd predictable disaster to another. Along the way the audience is subjected to unpleasant music, shouting, and repetitive, obnoxious, uninteresting dialogue. If there was a sentence without a four letter word I did not notice. The characters never have any psychic development, they are the in the same stuck place at the beginning of the play as at the end, and watching 90 minutes of self-destruction at close range was excruciating. It seems that this play needs to go back to the drawing board. The author needs to add some hope of recovery, so that the audience can actually care about what happens on stage.